Recent developments in massive open online courses (MOOCs) have brought renewed attention to online learning, but most of the attention has been centered on courses offered through platforms such as Coursera and edX. This paper focuses on the importance of examining alternative, large-scale learning initiatives that promote more participatory modes of education production and delivery. It presents a comprehensive description of the Peer 2 Peer University (P2PU), a social computing platform that promotes peer-created, peer-led, online learning environments. Using log data from the P2PU platform, the ecosystem of this learner-generated education platform is described. The descriptive analysis highlights P2PU's growth in terms of the participatory learning environments that have been created – such as online study groups, courses, and challenges – and also describes the participation patterns of P2PU members. This paper provides one of the first empirical descriptions of an emerging open learning platform and illuminates how log data from the platform, particularly in relation to open courses, open badges, and learning tasks embedded in courses, can be used to track development of courses and engagement in learning activities across P2PU. The analyses reported here are aimed at helping researchers understand the P2PU ecosystem and identify potential areas for future study as P2PU works to open its data for public analysis. While recent platforms for massive open online courses (MOOCs) such as Coursera and edX have garnered substantial public attention, MOOCs were originally conceived of as participatory environments where groups of learners (from small to massive) collaborate to aggregate self-created learning experiences (McAuley, Stewart, Siemens, & Cormier, 2010). In this model of peer-based, open learning, a course might organize topics and guide the schedule. However, individual learners coordinate the learning activities by contributing blog posts, links to resources, and other media. This model brings to the foreground a bottom-up, crowd-generated approach to delivering online education versus the top-down approach implemented in popular platforms. Yet in spite of their differences, learner participation and engagement is a concern in both types of MOOCs (Waters, 2012). At a basic level, any learning platform requires participant engagement to achieve its goals. Individuals must participate in the provided activities in order to have the learning experiences that are the focus of the platform. Beyond this basic form of participation, crowd-generated learning platforms require learners to engage in many other activities such as creating courses and learning materials, joining online courses, contributing comments and discussion, and persisting in the group's learning activities. Creating a participatory MOOC environment requires both more coordinated work (Butler & Ahn, 2013) and more types of participation than top-down MOOCs that rely primarily on individual learner engagement (Ahn, Weng, & Butler, 2013; Kafai & Peppler, 2011). However, in spite of its importance, there has been little empirical work done on conceptualizing and measuring participation in large scale, open learning platforms. In the following study, the patterns of participation and engagement present in a prominent participatory, open online learning community, the Peer 2 Peer University (P2PU), are examined. An outline is first provided of how P2PU is an example of a peer-generated open online course platform that speaks to the original notion of participatory MOOCs. Then, statistics derived from a comprehensive dataset about P2PU courses and participant activity are presented, with the aim of exploring the question of how learners have participated and engaged with open online courses in P2PU. The data in this study describe the course ecology that exists on the P2PU platform using metrics such as the number of member-created courses, types of courses, patterns of course enrollment, and active contributions to these peer-to-peer courses over time. A descriptive analysis of the diverse learning environments that have arisen in this participatory, open education platform is also offered. This paper makes several contributions to research on open online learning communities. Recent developments in top-down MOOCs (Coursera, edX, etc.) have brought renewed energy and attention to online learning. It highlights the importance of examining alternative, and equally exciting, open learning initiatives such as P2PU. This paper provides the first empirical descriptions of an emerging open learning platform, illuminating how log data from P2PU, particularly in relation to open courses, open badges, and learning tasks embedded in courses, can be used to track the development of courses and engagement in learning activities across P2PU. Different flavors of online education are developing at a rapid pace, bringing to the fore numerous research questions and concerns. The descriptions presented in this paper are aimed to help researchers understand the P2PU ecosystem and identify potential areas for future study as P2PU works to open its data for public analysis. Understanding the different definitions of the term MOOC is vital to develop a nuanced understanding of how educational experiences are developed and delivered in various online platforms. Recent, high profile MOOC examples such as Coursera, edX, and Udacity represent what some term "xMOOCs," with their institutional, top-down, content-delivery driven models (Siemens, 2012). Courses in these platforms are typically designed as a weekly syllabus of video lectures followed by quizzes or other assignments that evaluate whether students understood the content. Discussion boards are also often provided for students to ask questions and seek clarification on information related to the course. These courses mirror the structure of what was seen in most online education platforms. The major innovations have been the ability of these platforms to curate and freely deliver content from elite universities and garner "massive" enrollments of thousands and tens of thousands of learners. In contrast to this traditional model of teaching and learning is what educators have referred to as connectivist MOOCs or "cMOOCs" (McAuley et al., 2010; Siemens, 2012). This original form of MOOC was viewed as an experiment that leveraged the distributed, networked information available on the Internet with the learners themselves generating most of the learning activities. Learners might write their own reflections about what they are learning on blogs and other social media platforms, share these back with their peers, create social networks with others in the MOOC, share information, and aggregate their ideas to create an emergent learning experience. This form of collective learning differs from the xMOOC model in several significant ways (Kafai & Peppler, 2011). First, the modes of production differ dramatically. In xMOOCs, elite institutions such as Stanford University, Harvard University, Massachusetts Institute of Technology, and partner universities develop courses. In cMOOCs, the underlying philosophy is that any individual should be empowered to design a learning experience. Second, course implementation and the role of learners are conceptualized very differently. In an xMOOC, learner responsibilities focus on consuming the course content and completing evaluations to assess understanding of that content. In a cMOOC, learners may utilize the course-provided content, but as one resource among many that they may access through their own online searching and research. Learners take on the dual role of learners and teachers, as they help their peers through the learning process they are also undertaking. In a cMOOC, the content of the course is user-generated and emergent, arising from the persistent contributions of the learners themselves. Leadership is distributed and the learning experience is severely limited if there are only a few students generating ideas and information. Connectivist or collectivist MOOC environments build on broader trends in computing and technology-mediated social interaction. These versions of MOOCs leverage the capabilities of social computing, where networked media and technology enable individuals to easily share information, communicate with others, and drive online content-creation (Parameswaran & Whinston, 2007). Thus, instead of treating learning as information transfer from instructor to student, learning is conceptualized as arising from social interaction and information sharing via networked tools. A collectivist philosophy of online education also represents a particular instantiation of crowdsourcing. The term crowdsourcing describes the use of technology to outsource a task typically done by a particular agent or person by distributing the task to a large group of people to do collectively (Howe, 2006). In the MOOC context, one could observe the process of course creation as a crowdsourcing example. In xMOOC platforms, course creation is crowdsourced, in a sense, to individual universities and their instructors, but aggregated in a central platform. Yet at a micro-level, courses are still designed and created by a single source, the instructor. In a cMOOC context, the course content and design are further crowdsourced to the learners themselves. Rather than one source of information and content, learners form online social networks in which they share and aggregate content across multiple channels. Through the use of social computing platforms, education could potentially be a crowdsourced endeavor, where learners create, manage, and collectively implement large-scale, online courses. P2PU is non-profit organization and online platform that began in 2009. The online community promotes experimentation in open learning and peer-led education. The platform allows any member to design and create an educational course, which can then be taken by any other member in the online community. In P2PU, learning environments come in a variety of formats (with courses being only one instantiation). The general term used in P2PU is learning "project," and this term will be used in the present paper to speak generally to different P2PU learning situations. More specific terms refer to particular learning environments. In P2PU, members can create study groups to bring together learners around topics of interest for a set period of time. Members can also create more formal courses that are structurally similar to study groups. The most recent iteration of P2PU adds challenges, which are asynchronous courses that remain persistent and act as guides for learners through an educational experience (rather than being time-bound). Learners in P2PU can join, complete, and leave challenges at any moment. P2PU has also introduced new forms of collective assessment through open badges. Learners can earn badges associated with different learning tasks and courses, which tie into the Mozilla Open Badges framework (The Mozilla Foundation & P2PU, 2012). Study groups, courses, challenges, and badges are all important constructs that P2PU provides to organize peer-generated learning experiences, and each will be considered in the analysis presented below. In many ways, P2PU is a social computing platform that crowdsources the creation and implementation of informal online education. Instead of formal teachers or established institutions acting as the sole developers of online courses, any stakeholder can create a course in P2PU. In addition, the mission and ethos of the P2PU community encourages a social process of learning. Courses are not designed merely as content delivery mechanisms, but as spaces that ask members to engage in active learning projects, share their progress and resources, start and participate in discussions, and collaborate to gain knowledge of a topic area. Similarly, P2PU's experiments with open badges are a way to observe how social assessments of learning can be recognized and credited in open, informal learning environments. As a crowdsourced education platform, the success of the community is critically dependent on each member's active and persistent participation. How have learners participated and engaged with open online learning in P2PU? How many courses and challenges comprise the P2PU community? What patterns of participation can be observed in these learning contexts? What are the characteristics of learning environments within P2PU? How can learners' participation and engagement in these contexts be measured? These descriptive analyses of the P2PU community can then inform future researchers seeking to explore complex relationships between learning context characteristics and learner participation, and engagement. The study reported here was part of an ongoing partnership with P2PU, in which the main goals are to: (1) create policies and processes to publicly share datasets of the P2PU platform; and (2) conduct analyses of this widely used open education platform to shed light on the challenges of supporting large-scale, participatory, online learning. The project includes substantial data work to transform raw P2PU log data into usable variables and datasets for researchers in education and other related fields. In addition, the research team is exploring various learning analytics techniques for illuminating the learning processes that occur in this online community (Bienkowski, Feng, & Means, 2012). In October 2012, P2PU provided the research team with a raw dataset containing a complete record of all elements of the platform (courses, challenges, users, learning activities, etc.). 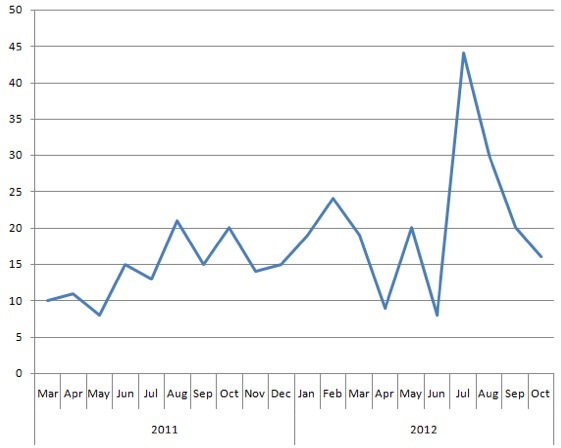 This dataset covered the entire history of P2PU from its beginning in late 2009 to October 2012. The data was a copy of the back-end mySQL database that is the operational foundation for P2PU.org and consisted of 82 tables. In an initial phase of data exploration, the research team developed a high-level mapping of the tables that corresponded to the primary components of the P2PU platform and their relationships to one another (Figure 1). 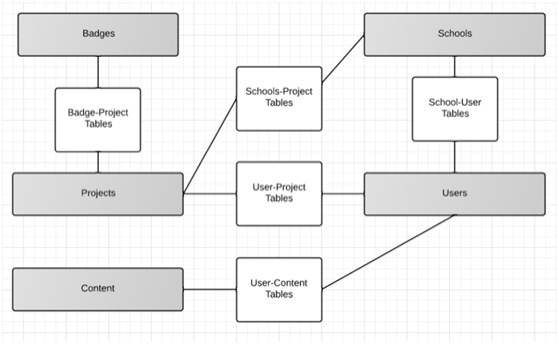 This study utilized log data from those tables that described P2PU Schools, Projects (e.g., the different types of learning contexts), Badges, Users, and user Content contributions. Although the database theoretically provided a rich, fine-grained record of P2PU schools, projects, users, their activity, and badges, the raw log data was structured in terms of operational transactions and entity status records which did not readily correspond to the constructs most likely to be of interest to researchers and analysts. To overcome this mismatch the research team first conducted a phase of data exploration and descriptive analytics to construct a holistic understanding of various levels of the P2PU community. Then on this basis, a project-level dataset was created that characterized the nature, history, and activity associated with every project (e.g., study group, course, challenge) ever created on the P2PU platform. This analysis dataset included a number of variables for each project, which are described in turn below. Project name: Name of the P2PU project. Language: What language the project uses (e.g., English, Spanish). Project category: What type of project is it (study group, course, or challenge)? Under development: A binary flag that designates whether a given project is under development or "live" and available to the public. Deleted: A binary flag designating whether a project has been deleted. Archived: A binary flag designating whether a project is no longer publicly available and has been archived. Project pages: A count of how many website pages have been created for a given project. Organizer count: P2PU project may have one or more creators or leaders (known as organizers). This variable indicates how many unique organizers are associated with a project. Participant count: P2PU Members can join study groups and courses as active "participants." This variable is a count of how many members have joined and self-designated as participants. Follower count: Members can also join study groups and courses as "followers," indicating that they will not actively participate but are interested in receiving notices about activity within the course. This variable is a count of how many members have joined and self-designated as followers. Total number of tasks: Each challenge consists of a series of tasks to be completed by learners. As they complete them, members record their progress by checking off each task. This variable indicates how many tasks are associated with each challenge. Adopter count: In challenges, members can join as active participants by working on tasks in order to complete the challenge. This variable indicates how many members begun working on the tasks associated with a challenge. Completers: In challenges, members can check off tasks as they work to achieve the challenge. When all the tasks are marked as completed, the challenge is said to have been completed. This variable is a count of how many members have completed a challenge. Average tasks completed: While some individuals complete all the tasks associated with a challenge, many do not. This variable captures the average number of tasks completed by the adopters of each challenge, providing a metric of the overall progress of the members participating in it. Total number of badges: Some challenges and courses are associated with badges that members can earn if they complete certain tasks. This variable is a count of how many badges were associated with a given project. Average badges earned: As with tasks, individuals can vary with respect to how far they have progressed with respect to the badges associated with a project. This variable captures the average number of badges completed (from those associated with the project) among the participating members. These variables were constructed based on an examination of the P2PU interface, consultation with P2PU developers, and detailed analysis of the P2PU platform code, which is available through an open source license. The constructed measures were also validated with SQL queries to multiple combinations of data tables of P2PU's backend database. To explore how learners have participated and engaged with open online learning in P2PU several platform-level metrics that provided a glimpse into P2PU's history, its ecosystem of learning projects, and members in the community were examined. The primary component of the P2PU learning ecosystem is the project. Projects are bounded collections of dynamic and static content, organizers, participants, and infrastructure. There were 2,034 project records in the P2PU database that are broken down into three different learning environment types: 1,135 study groups, 506 courses, and 393 challenges. Study groups bring together groups of informal learners together around educational tasks and discussions. Courses are similar in structure to study groups, but represent more formal learning projects that are open to anyone in P2PU. Courses organize around tasks that learners complete (and are typically structured as weekly tasks), in addition to threaded discussion pages where learners can participate in dialogue and share thoughts. In the recent iteration of P2PU, another learning environment called challenges was introduced. Challenges utilize a similar structure as courses but are asynchronous and persistent (whereas courses ran for a set period of time and learners dispersed). A challenge is a series of tasks and discussion spaces, where a learner can enter and exit at any point. Badges can also be associated with these challenges, which learners earn by completing various tasks. In approximately two years, P2PU has supported the creation of just over 2,000 distinct learning environments that combine a set of common elements to provide rich learning experiences for participants. While there are numerous projects in P2PU, they vary significantly with respect to their level of development. The majority of the over 2,000 projects in P2PU were tagged as "under development," which means that members experimented with creating these learning environments, but never implemented them live in the community. Most projects appear to have started development but were never finished and released live, and others were deleted from the site over time. Of the total, there were 368 projects (18.09%) that went live and were not deleted from the P2PU platform. Of these projects 159 were challenges, 132 were study groups, and 77 were courses. About 85% of these projects were in English and 12% in Spanish (with less than 3% in other languages). 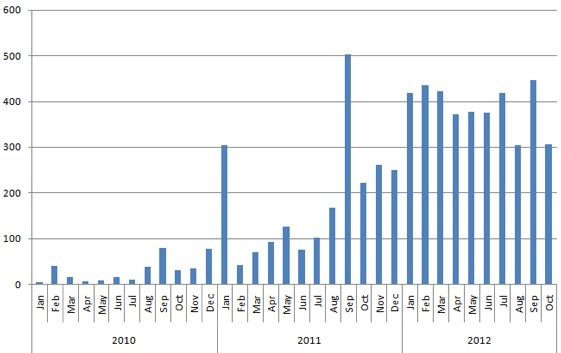 At the same time, it was also observed that in P2PU's nascent history, there has been a general trend of 10 to 25 new learning projects being developed and publicly released each month, with a sharp rise in July 2012 due to a special initiative that month (see Figure 2 below). Together, these statistics suggest that as a platform P2PU is able to successfully encourage individuals to experiment with creating a diverse array of participatory learning environments, but that a relatively small percentage of those projects are ever implemented as operational. Future research should consider the issues related to the development of learning projects in P2PU, strategies for fostering more complete learning project development over time, and analysis of whether this ratio of experimentation to "published" projects is optimal. In addition, there are rich opportunities to understand the barriers that individuals may face in the creation of projects within such a participatory platform. Factors such as a lack of understanding of the P2PU platform, prior knowledge in topic areas, motivation, or lack of community involvement may influence the systematic production and availability of learning projects over time. Along with this steady development of peer-created learning environments, there were 41,281 registered members in P2PU at the time of writing of this paper. Such membership represents a truly massive group of potential learners, and positions P2PU as an example of a large-scale participatory learning environment. P2PU does not describe itself as a cMOOC environment, but rather a platform to promote open, informal learning. However, taking a broad view of the entire platform, it is an online community of over 40,000 potential learners who can share and create their own participatory learning environments and experiences. This large pool of potential learners is notable as an experiment in participatory, peer-led learning; nonetheless, participation and engagement issues remain, just as in any other online community. Data in the P2PU database provides time-stamped fields for when a member created their P2PU account and the last date they were active in the community (when they logged on). Using these fields, it is possible to create various overall participation metrics, such as how many P2PU members ever returned to the site after first creating their account. It was found that 6,483 members returned to P2PU at least once after account creation (approximately 16% of all registered members). This implies that that the majority of members (approximately 85%) created accounts and never again engaged with the community. While this pattern of overall engagement (or relatively lack thereof) is a potential problem for P2PU, it is consistent with participation patterns observed in other online environments (Cummings, Butler, & Kraut, 2002). Nevertheless, having over 6,000 active members in this community still represents a substantial pool of learners and contributors in this participatory learning community. Furthermore, as P2PU has continued to establish itself as an online community, one can also observe that they have consistently attracted 300-400 new members per month (who return to the site) over the 2012 year (see Figure 3). Overall, these descriptive measures of P2PU's growth and history show an online community that is in an early stage of development, but steadily growing both in terms of individual users and different types of participatory learning environments. To explore the relationship between these two interdependent elements of the P2PU ecology, metrics that describe how members participated and engaged within the context of study groups, courses, and challenges were examined. Members in P2PU can relate to projects in various ways. They can organize and create projects, or they can join in on projects as participants or followers. Of the 6,483 members of P2PU who logged in at least once more after creating an account, 4,730 (73%) have signed up to be an organizer, participant, or follower of at least one learning project. This suggests that of P2PU members who do return to the site, a substantial number attempt to become active members in projects by organizing a project or signing up to be a participant. There was also significant variation in the number of members participating in different learning environments both within and across the different types (see Table 1). For example, study groups and courses in P2PU typically had 1-2 organizers who created the learning group and initiated activities. The majority of these learning groups were small. The median number of participants in study groups was three members and the median in courses was five members. However, some study groups and courses grew into quite large learning environments. Study groups reached up to 370 participants and 1,167 followers (individuals who followed along but did not actively participate). The largest courses grew to 173 members and 319 followers. Membership in P2PU challenges is organized a little differently. Learners choose to adopt the challenge and the platform also keeps track of who has completed a given learning challenge (completers). Again, a majority of challenges are small, with the median number of adopters being two members – although the distribution is skewed with some challenges successfully having up to 158 (current) adopters and 694 completers. These descriptive statistics highlight the wide diversity of participatory learning environments that arise in P2PU. Many study groups, courses, and challenges attract only a few like-minded individuals. However, some projects attract hundreds of learners to create larger-scale learning environments. Again, while the skewed distribution of participation potentially presents a challenge for P2PU and other open learning environments, it is consistent with the distribution of group and forum sizes that has been observed in other online contexts (Butler, 2001; Butler & Wang, 2012; Jones, Ravid, & Rafaeli, 2004). Future research that explores the relationships between support for development of focused learning environments, characteristics of the created learning environments, and the resulting patterns of participation would make substantial contributions to understanding how open learning communities such as P2PU can function more effectively. As the P2PU platform has developed, support for different types of learning environments have been added. Initially, study groups (time-bounded, unstructured group interaction spaces) were supported, then courses (time-bounded, guided exploration of topics, with associated group interaction). Most recently challenges were introduced as ways to organize learning. Challenges are organized as an informal syllabus, consisting of a checklist of tasks. P2PU members join challenges and when they complete various learning tasks, they check off these tasks as completed. One unique affordance of this feature is that P2PU logs a record of challenges, tasks, adopters, and when these adopters checked off tasks as complete. Using these logs, measures of the persistence and engagement of participants in P2PU challenges as of October 2012 could be calculated. The detailed logging of tasks provides some nuanced ways to conceptualize and observe persistence and engagement. For example, challenges in P2PU had an average of 4.67 learning tasks that members were asked to complete (Table 2). On average, members reported completing roughly half of the available tasks (2.24 average number of tasks completed per adopter). Interesting future research streams emerge from this descriptive data. For example, using the P2PU data it is possible to examine longitudinal trends of when P2PU members complete tasks and how other variables influence this task completion. In addition, future research might examine how characteristics of challenges, tasks, and P2PU members and their social networks relate to the completion of tasks over time. Note. N = 159 active challenges in P2PU. In addition to tasks, P2PU had recently begun piloting an open badge system based on the Mozilla Open Badge Framework (The Mozilla Foundation & P2PU, 2012). The idea behind open badges is to provide publicly visible credentials for informal learning, and there is a rich area of future research to examine the varied social, cultural, and educational functions of online badges and informal credentialing (Abramovich, Schunn, & Higashi, 2013; Antin & Churchill, 2011). As with study groups, courses, and challenges, members of P2PU can create badges that other members can earn by completing different learning tasks and challenges. Badges are also logged in the P2PU system and provide a way to measure and understand learner achievements and their engagement with learning over time. As of October 2012, the implementation of badges was in an early stage. As a result, many challenges did not have associated badges (i.e., challenges had an average of less than one badge associated with them). Some challenges had up to eight associated badges with some activity in members earning badges (Table 2). In future research, some interesting avenues could include examining learners' trajectories of badge earning and the different social dynamics at play in P2PU in relation to badge earning (e.g., to better understand who creates and earns badges, as well as what the predictors badge earning are). One lesson from the recent rise of MOOCs (Pappano, 2012) is that new forms of online education will most likely endure, evolve, and become a vital part of how education is delivered in the future. Much of the initial excitement and attention to MOOCs have risen from a particular version of online learning, the xMOOC. This paper has highlighted how alternative, participatory forms of education production and delivery can develop within and be supported by social platforms such as P2PU. In such participatory, collective cMOOC contexts, participation and engagement take on varied forms. Courses must be developed, assessments created, fellow learners recruited, and learning environments sustained over time through engagement and participation. These different functions bring about new challenges to sustaining robust, large-scale, participatory learning environments. The challenges illuminate potentially high-impact research areas that could make a substantial contribution to improving and evolving large-scale, online learning that are alternatives to the high-profile examples that are popular today (Coursera, etc.). What challenges do they face in creating participatory learning environments? What skills are needed to create effective courses, such as instructional design, and more importantly, how can the learning of these skills be "scaled out" to everyday individuals to foster more effective crowdsourced course development? What factors are related to courses actually being implemented in P2PU? Research in this stream would shed light on issues such as new forms of organization, instructional design, and production of education in a participatory, open, social computing context. The analysis also highlights the wide variability present in the online learning environments that are present in P2PU. In a participatory setting such as P2PU, the majority of learning projects serve small groups of informal learners who come together around specific topics. These learning arrangements represent the long-tail of the ecosystem of learning contexts in P2PU with many courses that serve a few individuals around niche interests (Brown & Adler, 2008). A small number of P2PU projects successfully garnered the participation of hundreds and thousands of interested learners, and could be viewed as a form of cMOOC. Individual P2PU projects that garner thousands of students introduce new issues of educational practice at scale. However, the aggregation of hundreds and thousands of smaller learning arrangements in a platform such as P2PU also combines to create an alternative, and uniquely large-scale, ecology of education opportunities. Future questions remain concerning how to foster robust learning communities from this ecological perspective (Butler & Ahn, 2013). How many courses and members are needed to foster participation and learning activities? What factors within courses or learning projects are related to fostering engagement over time (e.g., Ahn, Weng, & Butler, 2013)? How can platforms such as P2PU foster the development of participatory learning behaviors such as social network formation, knowledge sharing, and active learning opportunities? Finally, the P2PU platform also affords opportunities to examine concepts such as participation and engagement through new artifacts such as online learning tasks and open badges. It has been demonstrated here how log data of learning tasks in P2PU can show the variability of learning activity conducted by members. Future work is possible to examine longitudinal patterns of the learning tasks P2PU members undertake, which may provide indicators of sustained participation and engagement. In addition, research that can examine the relationship between factors such as course design, social interaction, and networks with the completion of learning tasks over time can make a substantial contribution to fundamental questions around supporting online learners to persist and not drop out of courses over time. P2PU's early piloting of open badges, and their logging of badge creation and earning behaviors, can also serve as an exciting context to explore the social, cultural, and educational functions of badges in online learning. These research areas promise to rise in importance as badges, and other artifacts of informal educational credentialing, become a major element of online learning in the future. Overall, P2PU provides a rich environment for addressing many fundamental questions about the development, operation, and use of large scale, open, online learning platforms. While this work is still in its early stages, it provides an initial look at the way that focused learning environments, such as P2PU study groups, courses, and challenges, are developed (or not), are adopted (or not), and are engaged by learners (or not). Realizing the potential of MOOCs and other forms of large scale, technology-enabled learning environments will depend not only on understanding how to provide appropriate experiences for individual learners, but also on our ability to design platforms that provide the affordances necessary to support development of diverse populations of focused learning environments.